My grandpa had some of last season’s figs in the freezer all mashed up. I was watching the new season figs closely, drooling for the day they would ripen. I realised I could bring the two together in a wonderful fig pudding and serve it with a honey caramel sauce. This recipe contains no refined sugar. You could easily substitute coconut or some other non-cane sugar in the pudding. Although not exactly light, this is a wonderfully tasty dessert. The richness of the puddings is livened by the fresh figs and complimented by the honey caramel sauce. *Spelt flour is low in gluten and has a lovely nutty taste. I think it’s great in this recipe, but you could substitute all purpose wheat flour if you like. Cream the sugar, butter and cinnamon till pale and very fluffy. Beat in the egg. Sift over the flour and baking powder. Fold through the figs and dry ingredients till just combined. Grease muffin pans or small kugelhof pans and scoop in the mixture till the cavity is just less than full. Arrange the tins in a water bath and bake in a preheated oven for approximately an hour or until a skewer inserted into the middle comes out with a few moist crumbs attached. Slice the figs in half. Serve the puddings warm topped with two fig halves and a generous drizzle of honey caramel sauce. This entry was posted in Autumn, Dessert and tagged cake, fruit, garden, pudding. Bookmark the permalink. 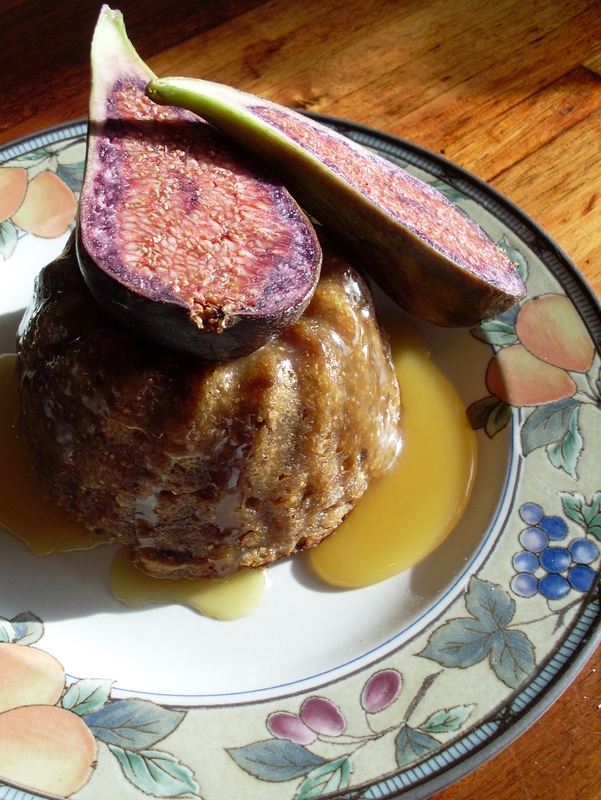 I had just finished reading the recipe for your honey caramel sauce and bookmarking it for trying soon when I came by the fig puddings…. I cannot but look forward to trying the combination. 😀 that’s great Aruna! You won’t regret it! Thanks Gary. It sure tasted that way! Hello my dear! I was hoping you’d see it! I don’t see why you couldn’t steam them properly. I’m not an expert on proper steaming, but if you’re good at it I think it would be wonderful. I guess the key will be allowing the pudding room to rise in the cloth. If you do that I’m sure it will be wonderful. Happy cooking!!! Perfection! The combo with your honey caramel sauce must be out of this world.